Eleanor Bond was born in Winnipeg, Manitoba in 1948. She graduated from the School of Art, University of Manitoba in 1976. 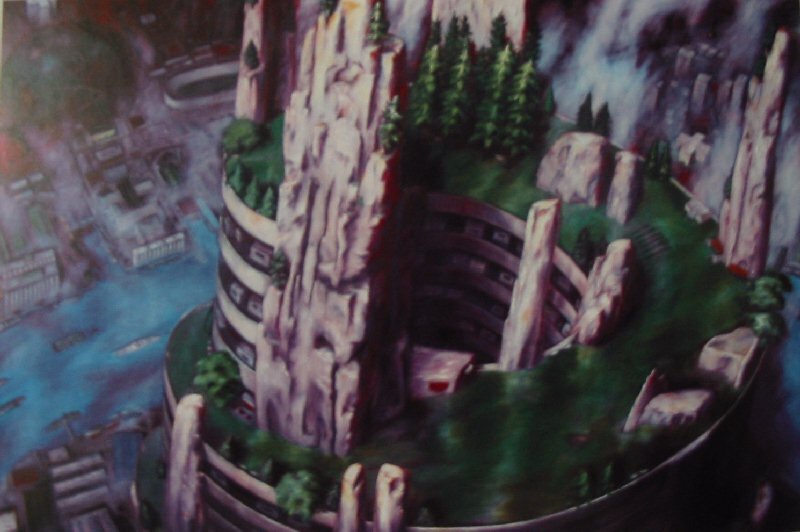 In a nutshell she depicts futuristic cities in which cityscape merges with nature. 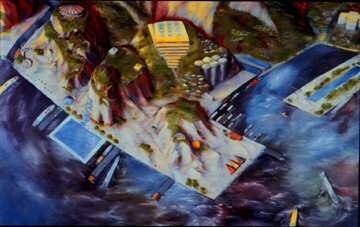 She creates an imaginary utopia using a topographical perspective so the viewer gets a glimpse of what "could be" if we chose to build it. All of her buildings could be built using existing technology. Since 1985, Winnipeg artist Eleanor Bond has produced large canvases that show cityscapes transformed by her contemporary ideas of green space, place and community. The works show imaginary urban environments in which shapes and forms merge, a metaphor for the merging of nature and architecture. Her large unstretched canvases engulf the viewer in a surreal world that encompasses the current environmental and social dilemmas of living in a city. She blurs her subject and alters the viewer's perceptions thereby creating a sense of vertigo and dizziness. 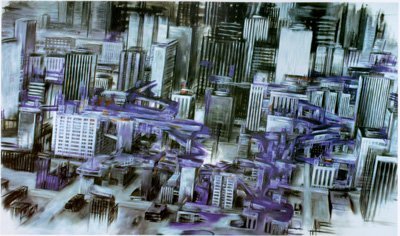 Her paintings are distinguished by the balance between the familiar cityscape, combined with a depiction of an unreal world, whose impact on the viewer belongs more to the realm of the imaginary. The futuristic aspect of her fictional sites holds our attention as she explores the ideas and contradictions in the contemporary city. The city is not a utopia, but it is a possibility. Her cities may be imaginary places, but the technology exists to build these places now. The artist lives and works in Winnipeg and sometimes Montreal where Bond currently teaches at Concordia University. Painting and architectural design have always had lots of things in common. They are both a form of drawing, but they are also separated by innumerable differences in terms of how they are used and their meaning. They also come from dramatically different groups of people. Painters tend to be more eclectic and decorative whereas architects lean towards engineering and simplicity. Bond's "Social Centres" are both architectural proposals and paintings. Because they are both the viewer shifts back and forth from looking at them as possible designs for buildings to regarding them as aesthetically pleasing paintings. Unlike normal landscape paintings where the viewer is asked to appreciate the aesthetic content of the scenery this instead offers the viewer the opportunity to imagine the future, the present and what is possible architecturally. The size of the paintings adds emphasis to the topic and allows the viewer to take the ideas presented to them seriously. Its difficult to ignore when you feel a bit dizzy just looking at it. Since it is possible to build every structure that is depicted in Bond's "Social Centres" it creates a sense of hope for the future. The paintings are positive and upbeat. Compared to the drawings of some architects such as Soleri or Archigram where buildings are fanciful and impossible to build, Bond's structures are plausible as real buildings. In terms of modern architectural drawings they are roughly drawn, but that doesn't matter because the idea is presently so forcefully and brilliantly. She tends to avoid rigid straight lines, something an architect would never do. The paintings give the impression of a blurry glimpse of the future, but they are nevertheless drawn explicitly enough that there is no doubt that they could be actual buildings. The biggest problems for the builders would be in gouging out the landscape forms that Bond has imagined because some of the ideas are quite massive and would require a team of engineers and hundreds of workers (like building the Hoover Dam). Still Bond's landscaping would not be a problem. For me Eleanor Bond's creations are a visual manifesto for where architects of the future need to go, and could go immediately if companies were willing to fund such buildings. The "residential parkade" above is a parking garage for mobile homes. It spirals upward like a small mountain covered in lush grass and rock faces for mountain climbing. Book of Interest: "Aspiring to the Landscape: On Painting and the Subject of Nature"
Nature becoming part of cultural construction has been discussed extensively in postmodern theory. Little attention has been paid to the motivations behind merging urban landscape with nature. 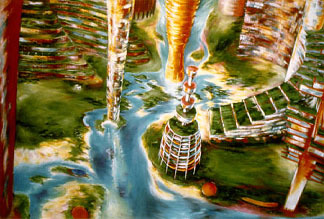 Aspiring to the Landscape examines this desire to merge the two and how it is manifested in contemporary landscape art. 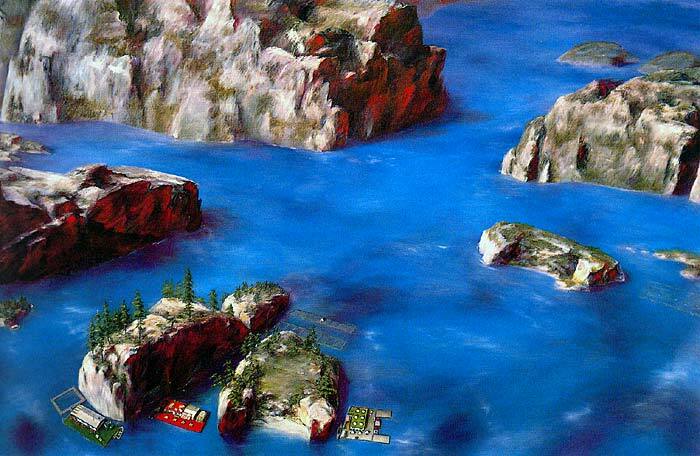 Four installations of large-scale paintings by Canadian artists Eleanor Bond, Susan Feindel, Stephen Hutchings, and Wanda Koop are the focus of Petra Halkes�s study. The works vary widely in style and iconography but are drawn together by the way they invite a reflection on the troubled relationship between culture and nature and our contradictory and simultaneous longing to conquer and to succumb to nature. It is the tension between modern and postmodern interpretations of the subject of nature that makes the theory and the artwork discussed in Aspiring to the Landscape so important to contemporary Canadian culture. Petra Halkes is an independent curator, painter, and art critic living in Ottawa.